Myrtle (Dolly) Falkinburg, 98, of New Gretna, died on May 30th, 2018 at Southern Ocean Medical Center, Manahawkin, NJ. She was born on January 20, 1920 in New Gretna to John and Olive(Cramer) Wiseman. Myrtle held various jobs through the years working at Littman Jewelers in Atlantic City, Woolco Dept. Store in Pleasantville NJ, Bass River Township as Violations Clerk, and lastly, the New Gretna Post Office in a custodial position. 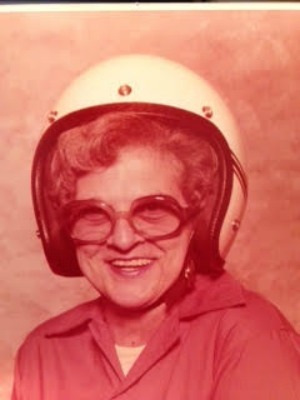 Myrtle’s great passion was driving a racecar. She was a Women’s Stock Car driver from the 1950’s thru the 1970’s, winning many races. Myrtle was the 1978 Point Champion in the Powder Puff Division at Pleasantville Speedway. She was also given the 1999 Legends of the Fall Sports card award at New Egypt Speedway. Myrtle was predeceased by her son, James A. Falkinburg in January of this year. She is survived by her granddaughter, Patricia Ann Colon (Anthony), great-granddaughters, Brittany Margaret Colon and Julianna Myrtle Colon, as well as many nieces, nephews, and extended family. A memorial service will be held on Monday, June 25, 2018 at 11AM at Lowenstein-Saraceno Funeral Home, 58 S New York Rd. Galloway, NJ. Interment will follow at Miller Cemetery, New Gretna with a luncheon following at New Gretna Fire House.